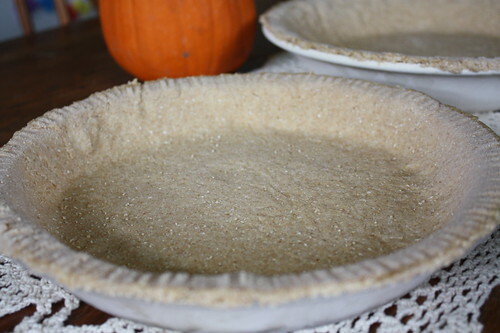 Whole Wheat Pie Crust Recipe: Make it from scratch! Unless you are on a gluten-free diet, making your own homemade whole wheat pie crust is a great way to make your pies a little healthier this year. If you are gluten-free, substitute rice or soy flour for the whole wheat flour. Be sure to read how to mill flour in a blender. If you love this, you’ll love this Apple Pie Smoothie recipe! Be sure you check it out and all the other Holiday Smoothie Recipes! In a mixer (or by hand if you are daring enough), mix dry ingredients and coconut oil/butter together. Once you have good looking crumbs, slowly start to add your water. You should start to have a pliable ball of dough. Once you reach that consistency you can stop adding water. Depending on your flour, you may need to add more/less water. If you add too much, don’t worry! Just add some more flour to the mixture until you reach the right consistency. On a sheet of wax paper, roll out your dough with a rolling pin. Use extra flour on your rolling pin, wax paper and hands so that the dough doesn’t stick. Once you have a nice flat and round pie crust area, pick it up – wax paper and all. Use the wax paper to turn your crust over and place it in your greased pie pan. Remove wax paper, and shape your pie crust. Trim the ends around the edge of the pie plate. Bake your pie crust at 450 for about 10 minutes until you have a pretty golden brown. You can skip the last baking part if you will be baking your entire pie for a significant amount of time. I’ve skipped this part, and just gone straight to adding the filling and baking the entire pie in the oven. I’ve used this recipe trying both coconut oil and butter, and I can’t tell a difference between the two. Since coconut oil is a better fat than butter, you might as well use it! Just don’t add coconut oil to cold flour, as it will harden and you will have a tough time making your dough (I’ve made that mistake several times!). Once you are finished, you are ready for your scrumptious pie filling. 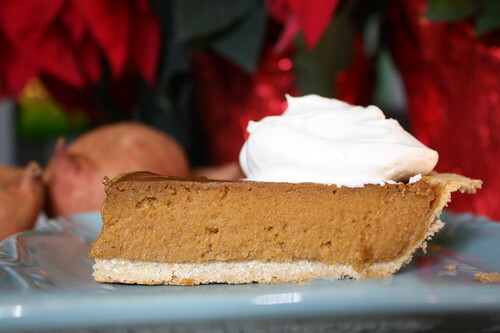 This can also be used for making homemade pumpkin pie, sweet potato pie, or breakfast pies. What are some of your favorite pies? I was woundering if you had any ideas for a good cherry pie glaze??? Hey MM! Just do some butter mixed with confectioners sugar and a little milk. It’s what I use for all glazes and frostings. Make it runnier with more milk or thicker with more sugar. What do you mean by cold flour? Does this still come out flaky when you use softened butter/coconut oil? I always keep everything (flour, butter, water) VERY cold when doing pie crusts to get a flakey crust from the pieces of fat. Yeah I have experienced that as well! Hi! Can I use white whole wheat flour in this recipe instead? Also, do you think it would make enough for the tops of four personal pot pies? They would probably be in ramekins. Thanks! This is an awesome recipe. Thanks for sharing!